Contractor Roseboom is in the process of renovating the Koperwiek shopping mall in Capelle. The culvert located under the mall must be renewed and partially renovated. For this purpose the waterway is dammed on both sides. Should there be a calamity during the renovation, the water must be moved as quickly as possible without removing the dams. 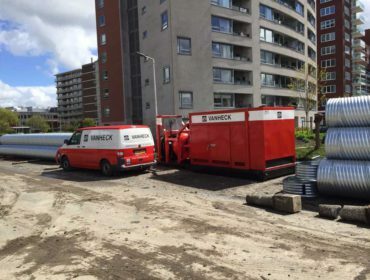 Van Heck supplied a silenced diesel powered HK500 pump for quick action if necessary.